It's time for some money-saving tips on how to DIY lovely but easy wedding bouquets and flower arrangements. We've all seen a ton of superb ideas on the wedding blogosphere, but sometimes trying to do it yourself is not as cost-efficient as you would like. Here are some tips on how to actually save money. Wholesale flower markets: Buy your flowers from a wholesale market and not from a middleman florist. They get their flowers from the wholesale market anyways, but they charge you a premium that is really a convenience fee. Plus, you can usually bargain with wholesalers - the more you buy, the less they will charge you per item. As these are all wholesale markets and not single shops, definitely make sure you take some time to peruse through the different shops and do price comparisons. When I was planning my wedding, I found that some wholesalers were willing to negotiate more than others, so make sure you do your research! Do note that among these flower types, there are price differences as well. 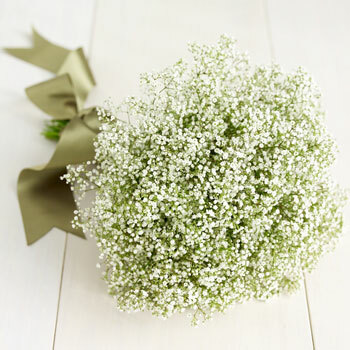 Babies Breath is only a couple of dollars for a bunch while Calla Lillies can price anywhere between $2-5 per stem (10 stems make a bunch). But please remember that price and beauty are not directly correlated, sometimes a full Babies Breath bouquet looks vintage and cute. Flower volume: Bouquets and centerpieces look better the fuller they look, so for your bridesmaid bouquets and for small centerpieces, I highly recommend flowers that already come in bushels. It will be less for you to arrange and definitely more cost-effective. Check out hydrangeas, which range from $2-5 per bunch. The below picture is 2-3 bunches. Peonies are also pretty large and in charge, but they look a little fancier for an evening wedding.